As part of the BAC's A Nation's Theatre Festival, All Tomorrow's Theatre brought together early career artists from across the UK, and set them in dialogue with venues and producers. Here, performance maker Paula Varjack offers a round-up of the day's conversations. In the last two months I have been to three conferences addressing the future of theatre, and/or surviving as an artist: Here’s The Change (part of Marmalade) in Oxford, I’m Still Standing (part of Mayfest) in Bristol and All Tomorrow’s Theatre (part of Our Nation’s Theatre) in London (and there have been two others that have happened in that time that I didn’t get to – Buzzcut’s Side Burns in Glasgow, and the infamous Theatre 2016. The reason why these discussions are happening with more frequency and urgency now is obvious. A lot of the systems we rely on appear to be broken: public funding, touring, and the brick and mortar of theatres themselves that create a barrier to many who feel they are not for them. Then there is payment (and lack of payment) for artists, which is finally getting much needed attention as a concern. Having open and honest dialogue is a crucial way to confront these issues, and people realise that we can only address them by working together . D&D have been doing this for over a decade, and I am sure have been part of affecting important changes, but the open space format (which I personally find really exciting and engaging) doesn’t work for everyone, so it’s great that these conferences are enabling discussion in other ways. 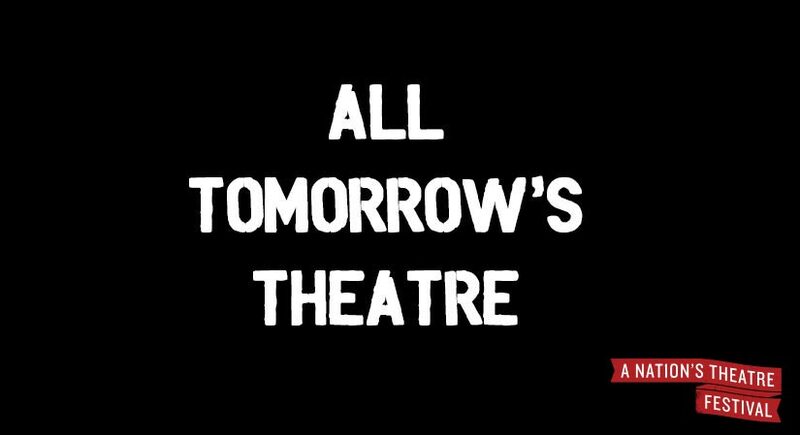 There were many elements of All Tomorrow’s Theatre that were well thought through responses to issues our industry faces. The provocations and panel discussions on artist development alongside venue development and sector development, the venue presentations that showed a myriad of different approaches to programming , and above all else, the emphasis on creating and strengthening relationships between venues and artists nationally. The day was introduced by Richard Dufty of BAC and Brian Logan of CPT (who joked that theatres with acronyms should stick together). It’s heartening to see these organisations join forces. With limited and decreasing resources, it is vital for organisations to share networks and best practice. It’s also worth mentioning that the event was delivered by Bethany Hayes of BAC and Amber Massie-Blomfield of CPT who clearly had worked tirelessly to bring so many organisations together. I was invited as a provocateur (a word I can’t look at without feeling silly) starting the day with a provocation regarding “emerging”. I questioned how long an artist could be emerging, the often unnecessary conflation of emerging with young, and how the majority of development schemes support the beginning of an idea, with very little to support a project after initial development so it can become tour ready, or to tour. This was followed by Chris Goode’s warm and funny provocation on the value of conversation: “Increasingly it seems to me that everything we do comes down to the quality of the conversations we have. Not just artist development, but actual art and actual development and pretty much everything we get out of bed to do.” It was the perfect frame for a day that would encompass many conversations on artist development, and the development of contemporary theatre as a whole. We then saw a video of Jess Thom of Touretteshero discussing disabled access. This was an issue many have raised with regards to other recent conferences. Theatre 2016 happened in an inaccessible West End venue, forcing disabled attendants to sit away from the stalls where everyone was else was sat, and away from microphones, literally left silenced. Jess raised an issue that rarely is mentioned even in discussions on access, making the important point that many venues had invested in public facing access, but had not made backstage areas accessible for disabled artists. She found this to be the case in half of the venues she was booked in for a recent tour. She spoke of bookings where she had had to perform in front of the stage, rather than on stage. She pointed out that this lack of access also affects disabled artists considering performing as a possibility. The rest of the day alternated between showcases from theatres around the country, and panel discussions that further explored some of the issues the provocations raised. Each venue shared how they approached artist development and then presented pitches and performance extracts by some of the artists they were working with. Though the work presented was stylistically very different, what all venues shared was a visionary approach to supporting artists to create work that was bold, while building and developing audiences in engaging with the work made. There was also a focus on supporting emerging artists and creating relationships with artists that were long term. Annabel Turpin of ARC, Stockton described a range of different initiatives supporting work at different stages, a result of her ongoing dialogue with artists to find out what their needs are and to make sure those needs are being met. She also spoke of how being an arts centre rather than a theatre meant a chance to connect with very different audiences. Sarah Brigham of Derby Theatre spoke of developing audiences for their more experimental studio work, through their theatre program, with their Retold series commissioning artists to create feminist responses to classical works in the main space. From the experimental and participatory focused National Theatre of Wales came an ethos driven by artistic challenge and risk, a push for artists to work in artforms they wouldn’t usually, and to create work in different contexts. There was also a focus in working site specifically, unsurprising considering that the National Theatre of Wales office is based in a high street shopping arcade. This was also reflected in the some of the performances that they presented, many of which were happening in different parts of the Omnibus Arts building over the day. The first panel discussion I sat in on was “Development Hell” exploring the tenuous journey from emerging to established, and from scratch to finished show. The conversation instead became a lively debate on various kinds of work in progress performances, questioning whether these were of benefit more to the venue than the artist, and if they did anything to build audience for shows. The consensus seemed to be that there is an audience for scratch nights that show a variety of artists, and can encourage audiences to risk seeing performers they don’t know. The problem seems to be the full length ticketed work in progress show. The issues raised around this were many. Sometimes artists felt it wasn’t the right time in their process to have a public sharing, but had to because of stipulations of the venue, or because it made for a stronger funding application. This meant that at times artists were sharing work they didn’t feel ready to share. The other issue was around future bookings. Jess Latowicki of Made in China spoke of festivals who did not want to book the finished version of a show that they had booked as a work in progress, as it had “already been booked”. She stressed how the point of having a work in progress programmed was in order to have the finished show programmed “That’s part of the deal!…or at least it should be!” Many people said that having too many work in progress performances meant struggling to sell tickets for the finished show. Jess Latowicki said that given the choice you would prefer an audience to see the finished work. I agree with that, and I imagine many artists would agree. So how might work in progress performances prevent that from happening? I was on the panel of the second discussion – What role place had in making work. There was discussion around the challenge some programmers face in building an arts ecology in where there were few artists, or where their vision in programmng, didn’t match up with the local work made. There was debate on the premise of “regional artist” and ‘regional theatre” as an arbitrary distinction that comes from a London focus. Many felt that London was becoming less of the creative hub it once was, as art students and artists increasingly can not afford to live there. Highlights of the artistic work being presented for me included the vibrant charm of Zoe Murtagh’s explorations around aging, the raw urgency of Luca Rutherford confronting loss and death, friendly but unnerving party hosts La Pelles Factory, Ben Tinniswood’s sound installation about child abuse (which days later I am still haunted by) and the playful confrontation of Jonny Cotsen’s Louder is Not Always Clearer, giving a sense of what it’s like to be hard of hearing in a hearing world. The day left me very inspired. Many I spoke to felt the same. As we become more aware of the tribe we are in making contemporary theatre and performance, and more challenges emerge, it is this sense of being part of something greater, of a national scene, that may give us the tools we need as an industry to move forward. Paula Varjack is an artist working in video, theatre and performance. Her current project Show Me The Money explores the obstacles artists face making a living in the U.K. today.